Until they stop relying solely on Havok’s charisma, Blaqk Audio will never move a crowd the in the way they clearly want. If you boast a musical career that dates back 20 years, you know a thing or two about a live set. 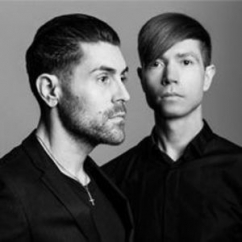 Davey Havok and Jade Puget each possess extensive knowledge on the touring life, both as a band and as an electronic duo. As AFI, they’ve played alt rock, punk, and screamo for the masses with equal talent and fervor, but their band showcases only one side of their performance chops, which extends into the EDM realm with Blaqk Audio. A project with origins dating back to 2001, Blaqk Audio combines AFI’s severity and shadowy elements with ‘80s-esque synthpop. To promote their latest effort Only Things We Love, the duo took to LA’s Regent Theater, whose concrete enclosure suited the electro mosh of the evening’s festivities. They opened the show correctly with “OK, Alex”, which heralded an evening of dark and deadly thrills. For the fans, the duo followed the opener with three tracks off of 2016’s Material. The tracks they choose reflected a more upbeat and synth-pop sound than what one hears on their latest album Only Things We Love. Once the crowd was nostalgically satiated, Blaqk Audio unleashed “The Viles”, starting a stream of cuts from the much heavier album. Unfortunately, Havok and Puget alone failed to fill the stage, which could benefit from more interactive visuals or even a pair of dancers. On his own, Havok delivered an impassioned performance, where he danced with the microphone as well as he sang into it. But he alone cannot carry the brunt of the visual element, and by the end his voice sounded pushed to its limit. Coupled with the fact the instrumentals occasionally drowned out Havok, the performance suffered a few awkward mishaps. With a bit more fanfare behind them, Blaqk Audio stands to become a stellar live act. Whether singing fresh tracks or unreleased demos from a decade ago, Havok largely sounded fantastic. A cover of Dead or Alive’s “You Spin Me Round”, their penultimate song, perfectly suited his straitlaced voice and the slightly goofy mentality of Blaqk Audio – Only Things We Love “confers” with cats on more than one song. A little extra production value, even just a looped visual in the background, could imbue their show with a little more excitement. Until they stop relying solely on Havok’s charisma, Blaqk Audio will never move a crowd the in the way they clearly want.